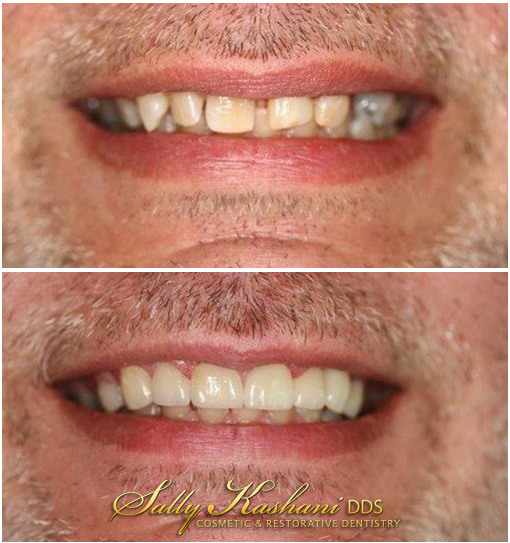 Dr. Sally Kashani is Hollywood’s premier dentist. Hollywood’s most renowned TV & movie stars as well as top businesspeople entrust Dr. Sally with their smile and oral health. Dr. Sally is recognized for her talent and compassionate approach to cosmetic and preventative dental care - simply, her dedication to her craft is unparalleled. Please feel free to navigate our dental site and ask any questions you may have. Contact us for with any insurance verification questions. Financing is available for all procedure. We are a full service dental office offering everything from root canals, to cosmetic procedures such as BOOST in office teeth whitening and veneers. Our main concern is you and your comfort. We have a relaxing office where we can also provide sedation dentistry services as well! We can offer you ipods, DVDs, wide screen glasses to keep you entertained while we give you a smile makeover! We are located in the beautiful Dermix Dental & Medical Spa Center and are conveniently close to both the San Fernando Valley and Hollywood areas. Please come see us so that we can give you the smile you have always dreamt of in a peaceful, relaxed environment. Best dental experience I have ever had. Dr Sally and her team made it such a pleasant visit. I have never Liked going to dentist but she definitely changed my mind. Such pleasant comfortable pain free visit super friendly staff definitely found my dentist. The best dentist I've ever been to! I initially went here for a wisdom teeth consultation. Before they did anything they went over my insurance with me so I would fully understand how much everything would cost out of pocket. I didn't know anything about my insurance so this was super helpful. It turns out I not only needed my wisdom teeth removed but i also needed a deep gum cleaning. They set up my appointments and even texted me reminders. Both procedures went flawlessly. I was so worried about being put under and they made me feel calm immediately. I will never go to another dentist in Hollywood! Hands down one of the best dentist experiences I've had. C'mon, everyone has had that one story that traumatizes their whole view on going to the dentist. This facility in Hollywood is beautiful. Everything looks nice and clean. The staff is very knowledgable and you feel comfortable. Sally, um, there's not enough words to describe her. She's amazing and made my visit very comfortable. I would recommend her 100X to anyone. If I were to close my eyes and dream up the dental office that I would want to go to, Dr. Kashani's Hollywood office would be it!! It is definitely not your typical dental office. They offer parking for patients in the back and once you walk in, you're greeted with such a calm and welcoming environment. Last month, I went to see Dr. Kashani in Hollywood for a cleaning and I had an absolutely wonderful experience with Dr. Kashani and her amazing staff. Alyssa, Kamila, Juan and Maria were incredibly sweet and provided me with plenty of knowledge and material to take better care of my dental hygiene. I have a small mouth and sensitive teeth so I can be a difficult patient at times, but everyone made me feel so very comfortable. I also love that you can watch Netflix or choose your own music on Pandora. It was an enchanting visit to a dental office and I look forward to my next visit! My visit to Dr. Kashani's office was nothing short of awesome. Usually one would not have such a great experience going to the dentist but this wasn't the case at all. Not only was Dr. Kashani the most gentle, patient and knowledgable dentist I have ever been to, I have to say the office setting was impressive too with state of the art examine rooms, super friendly staff and a gorgeous office setting in Hollywood. I have had about a dozen different dentists in my life, and they've all come in different shapes and sizes. Some I've loved, and some I've loathed; But Dr. Kashani stands alone at the top of my list. The entire office at Sally Kashani has a very good vibe. Everyone is kind, honest, helpful and always takes care of business. All the equipment in the office is top notch which corresponds with the great 1 on 1 attention all the staff and Dr. Sally gives you. I never enjoyed going to the dentist, but Sally makes it fun and painless and very comfortable. She has a very tender touch which is comforting to scaredy cats like myself. Also while doing my research, I found her prices are better than a lot of other dentists in Hollywood - you get alot more than what you pay for, you can't beat it. Thanks Sally I'm a customer for life!! Over time teeth can become discolored from lifestyle habits such as smoking, soda, tea, wine and coffee consumption. In office whitening procedures uses the whitening technology to get teeth white, fast. If you have some fear of the dentist, we will help ease the anxiety, we can provide you with oral conscious sedation. This allows you to be free of fear and anxiety but still be conscious enough to respond. Invisalign clear braces is one of the best advances that dentistry offers and can be used to transform your smile in a short time. They are custom made for your teeth and are effective, removable, clear and comfortable. Dr. Sally Kashani's knowledge in the art of dentistry, her attention to detail, and a pleasant demeanor make for a dental practice dedicated to providing patients with comfortable, personalized care.